TV to Go for mobile is FREE television in your mobile. 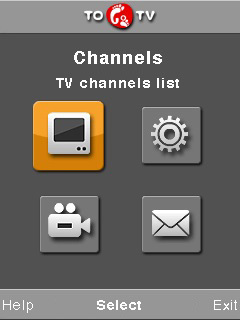 To watch mobile TV you need to download and install TV to Go for mobile software to your mobile. You watch TV for free, you only pay for internet-traffic (the price depends on your tariff, connection speed and the quality of the video). You can also buy and download to your mobile the video you liked most (0,20 to 1$ per one clip). You will receive the video in the best possible quality, etc. ...... TV to Go for Mobile shows you what's on, what's coming up and what's available for purchase. The only thing you need is mobile internet access. The TV to Go for Mobile works with GPRS, 3G or Wi-Fi. The App adjusts to the available speed in 10-15 seconds to provide the best picture quality. What TV to Go for Mobile broadcasts? Exclusive content created and acquired specially for mobile TV viewers: unique media, movies and TV programmes. Film festival shorts, animation, hot news, 5-10 minute auto TV programmes, sport and extreme amusements, pop news and much more. Video on demand, downloaded to your mobile. GoToMeeting is an online meeting solution. Qweas is providing links to TV to Go 3.3.0 as a courtesy, and makes no representations regarding TV to Go or any other applications or any information related thereto. Any questions, complaints or claims regarding this application TV to Go 3.3.0 must be directed to the appropriate software vendor. You may click the publisher link of TV to Go on the top of this page to get more details about the vendor.